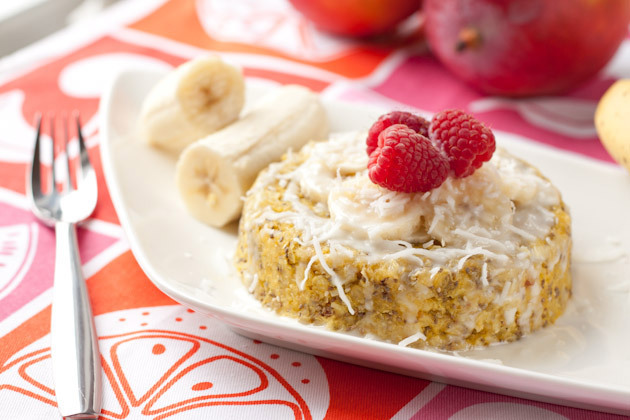 A light and summery quinoa flake breakfast bake filled with the taste of the tropics. Prepare a 16oz. microwave safe dish by oiling with a dab of coconut oil. Set aside. Place all ingredients in a small bowl and mix until fully incorporated. Press mixture into prepared dish and even out with fork. Microwave option: Place in the microwave and cook for 3 1/2 minutes. You’ll know when it’s done when it rises slightly, is harder to the touch, and pulls away from the sides of the dish. Don’t bake it too long, or you’ll have a Frisbee! 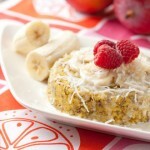 to make vegan, omit egg and add 1/4 cup of extra mango puree.